Comfort Works is providing me with materials at no cost so that I can share my experience recovering my Ikea sofa with you! All opinions are (always) my own. So I’ve been-done-lovin’ Comfort Works since I bought my first Ikea Karlstad sofa slipcover from them three years ago. That slipcover has held up great, but I’m a redecorating junkie, as you know. Now that my bedroom is wannabe-hipster-chic, I decided I wanted to make a BIG change to my living room, too! 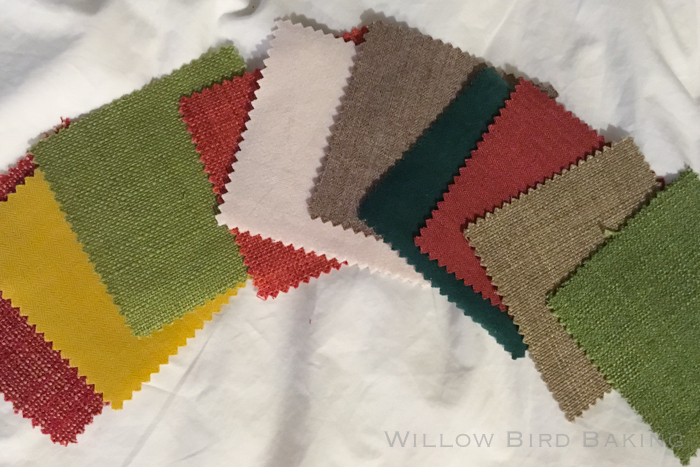 I loved the cool Willow Green (seriously, that’s the name of the color! So perfect, right?) that I paired with pops of sharp, happy orange and coral. 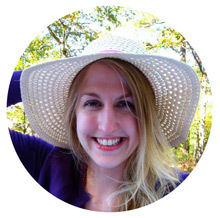 But now the relaxed, cool, artsy vibe of my bedroom has me dreaming of something different! 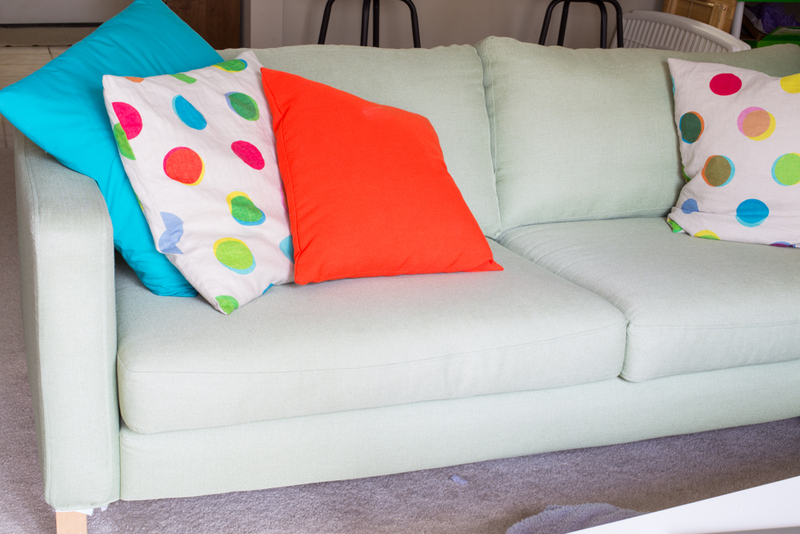 I contacted Comfort Works and we’re partnering to hipster-up my couch. Here are the samples they sent me to consider: can you guess which one I chose? It’s good to have a little something fun to look forward to these days! If you need a little something as well, might I suggest a hot cake? 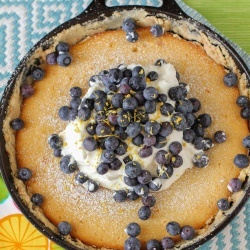 There’s nothing like a good hot cake, y’all. 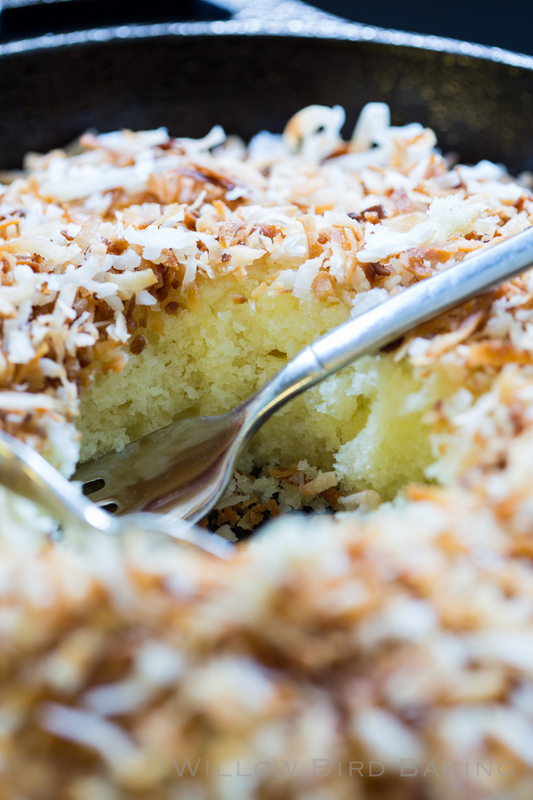 The easiest, quickest cake for coconut lovers! 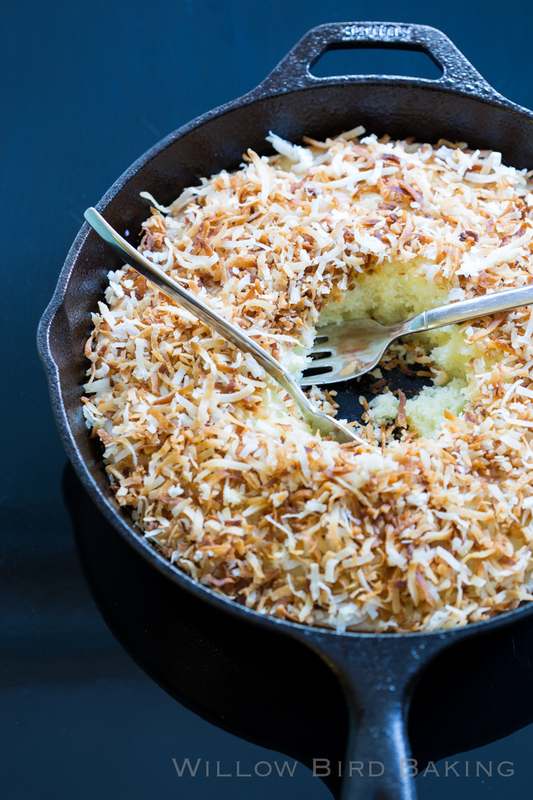 Perfect tender, moist white cake topped with delicious coconut glaze and toasted coconut! To make the cake: Preheat the oven to 375 degrees and prepare a 10-inch oven-safe skillet sprayed with cooking spray. In a medium saucepan over medium heat, bring the butter and water to a boil. In the meantime, in a separate large bowl, whisk together the cake flour, sugar, baking soda, and salt before whisking in the egg, sour cream, almond extract, vanilla extract. Mix to combine. While mixing, slowly pour in the boiling butter and water mixture. Mix to combine completely. Your batter will be very runny. Pour the batter into the prepared baking pan. 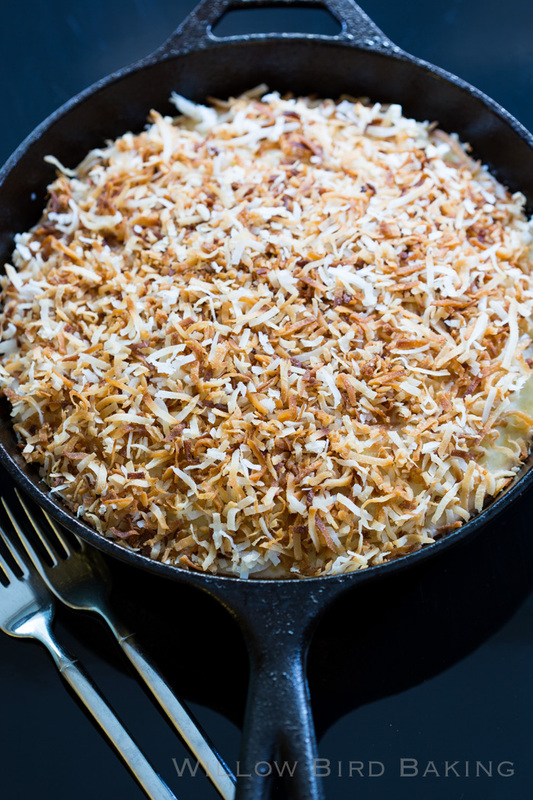 Bake at 375 degrees for 17-22 minutes or until a toothpick inserted in several places comes out with a few moist crumbs. To make the glaze: Whisk together the powdered sugar, water, and almond extract. Pour about half of the glaze over the hot cake and spread. A thin layer of glaze should cover the entire surface of the cake. 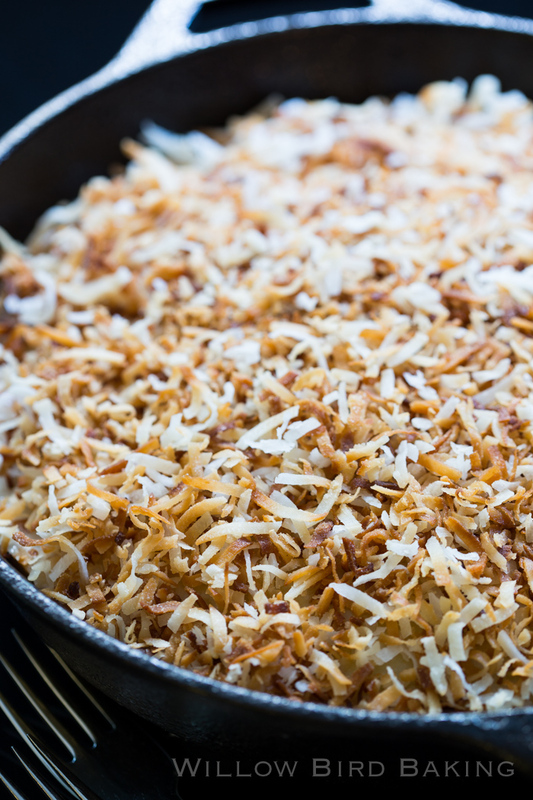 Sprinkle on toasted coconut. Serve hot.